Designed in collaboration with legendary guitarist Joe Satriani, the new VOX Ice 9 Overdrive combines the best of Joe's favorite vintage and modern distortion effects into one versatile pedal. 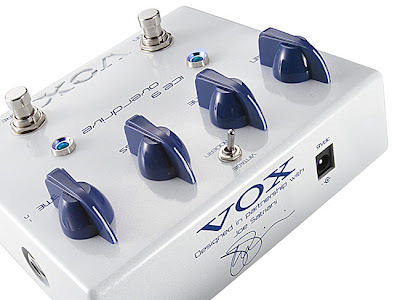 VOX Amplification introduces the Ice 9 Overdrive, the fourth effect pedal created in their continuing collaboration with Joe Satriani. 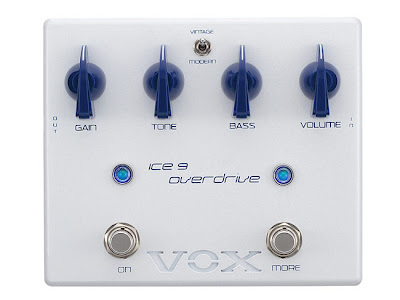 As with all of the previous VOX / Joe Satriani effect pedals, the Ice 9 has been created to provide a versatility of tone while meeting Satriani's strict standards. With two distinct overdrive modes, versatile tone-shaping and the ever-popular "More" switch, the Ice 9 delivers a wide range of inspiring tones, yet remains remarkably easy to use. The name is borrowed from the title of one of Satriani's popular songs on his smash 1987 album Surfing with the Alien. The Vintage / Modern mode switch provides access to two totally different overdrive voices; each is designed to Satriani's exacting specifications using carefully selected components. The Vintage mode employs a special op amp and premium diodes to offer an overdrive that is sweetly warm and classic, with just the right amount of sparkle and sustain. In contrast, the Modern voice utilizes a Germanium diode to kick up a cutting-edge overdrive that is altogether new and aggressive. The Gain knob can dial in any amount of overdrive from a warm, soft edge to a full-tilt onslaught. Working in conjunction with the Gain control is the Volume knob, controlling the overall volume level when the Overdrive effect is engaged. Stomping down on the "More" button kicks in a +14 dB volume boost that can cut through the mix in any situation.